EuroShogi starting position. For this diagram, generals are represented by queens. Casual games usually 10-60 mins. EuroShogi is a shogi variant invented by Vladimír Pribylinec starting in 2000. The game developed from an early version of chess variant Echos in 1977, leading to Cubic Chess, then later to Cubic Shogi, and finally to EuroShogi. Instead of classical units are used cubes that have a symbol on one side and on the opposite side have the same symbol by opposite colors, on the other side is a symbol of the promoted unit and on the opposite side the same symbol of opposite color, the last sides have no symbol - one is white and the other black. A major tenet of EuroShogi is simplification without radical changes, while maintaining good gameplay. The variant Heian shogi with playing board 8x8 or 9x8 is the only shogi variant somewhat similar to EuroShogi; other variants are larger or smaller, have new units, or lack drops. The current uppermost symbol determines a piece's type. Pieces are placed on the board so that they are oriented to the players areas without symbols. The game is played on an 8x8 board, where the furthest three ranks from each player is their promotion zone. The starting setup is as shown. Pieces capture the same as they move. Composition of pieces per player: 1 king, 1 tower, 2 shooters, 2 generals, 2 knights, 8 pawns. The king steps one square in any direction, orthogonal or diagonal. The king does not promote. The rook moves any number of unoccupied squares along any of the four orthogonal directions. Promoted rook is marked by the circle, it moves as king too. The bishop moves any number of unoccupied squares along any of the four diagonal directions. Promoted bishop is marked by the circle, it moves as king too. The general steps one square in one of the four orthogonal directions, or one square diagonally forward. (Six possibilities.) The general does not promote. The knight jumps at an angle intermediate to orthogonal and diagonal, equivalent to: one square frontal forward, then one square diagonally forward, in a single move. The knight leaps over any intervening men. The EuroShogi knight has an additional extension: it can also move one square horizontally to the side. Promoted knight is marked by the circle, it moves as general. The pawn steps one square forward. Promoted pawn is marked by the circle, it moves as gold. A player's promotion zone consists of the three farthest ranks (that is, the territory behind an opponent's pawns at setup). If a player's man crosses into its promotion zone, the player immediately promotes the man at the end of the turn. The king and general cannot promote. A pawn and the knight, after entering into the promotion zone instantly obtain a general movement by rotating its cube. After drop from the stack are they not promoted instantly, but even if they does move. A rook becomes to promoted rook, the bishop becomes to promoted bishop. A rook and a bishop dropped from the reservoir into the promotion zone are not promoted instantly, but even if they does move (out of, or wholly within the zone). Each player owns a stack for staging captured men, which are always stored not to promote. This is achieved by rotating a cube: captured unit changes a colour and loses a promotion. 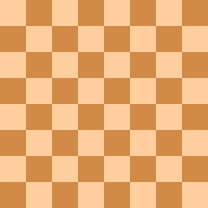 A player whose turn it is to move may either move a man on the chessboard, or drop any man from his stack on any vacant square, but a pawn may not be dropped on a file already containing a pawn of the same color. or on the last rank (there it can not move). Check, checkmate, and draws follow the same conditions as in classical chess. However, it is not permitted to give perpetual check in EuroShogi. A game can end in two additional (although uncommon) ways - by repetition or impasse . Impasse: The game might reach an impasse if kings are advanced into their respective promotion zones and neither player has any hope of mating the other; or, if there is no chance of gaining any further material.